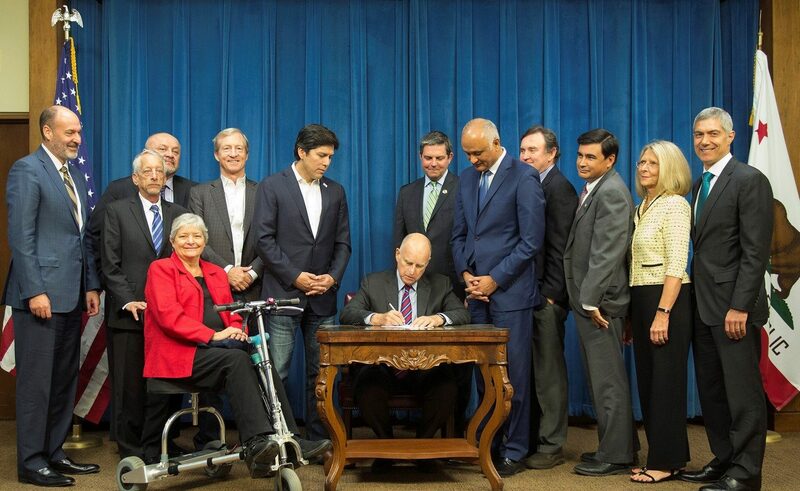 This morning, California Governor Jerry Brown signed SB 17 by Senator Ed Hernandez, nationally influential prescription drug price legislation, at a rare signing ceremony at the State Capitol. The new law will require prescription drug companies to provide advance notice and explanation for any price hike of more than 16% over two years. Despite a heavy lobbying and media campaign by the pharmaceutical industry opposing the bill, SB 17, strongly backed by a broad coalition of consumer, labor, business, insurer, and other health organizations, eventually won overwhelming bipartisan support with a 66-9 vote in the State Assembly, and a 32-8 vote in the State Senate. The bill was co-sponsored by Health Access, the California Labor Federation, and UNITE HERE. With every visit to the pharmacy and with every new headline about unjustified hikes in their medications, consumers have been clamoring for this type of action. While Congress debates cutting coverage and care, this new California law will benefit patients and purchasers, setting national policy in the process. No longer will pharmaceutical companies get to spike our prescription prices by double digits without telling us in advance or giving us an explanation. For existing drugs, SB 17 requires advance notice be given to public purchasers like Medi-Cal and CalPERS, as well as private purchasers including health plans and insurers, for any prescription drug price hike over 16% in the prior two years. It also enhances public disclosure of data about prescription drug pricing by requiring drug manufacturers to file information about the rationale for price spikes with the Office of Statewide Health Planning and Development including other increases over the last five years, any improvements made to the drug, and other specifics. The bill also requires health plans and insurers to disclose information about drug pricing through the existing rate review processes at the Department of Managed Health Care and Department of Insurance. This new law isn’t just transparency for transparency’s sake. This is prescription drug price transparency with teeth. Drug companies may think twice about raising prescription drug prices more than 8% a year (or 16% in two years) and triggering the disclosure requirements. Drug companies will have to justify and explain why the price of a medication, some of which have been on the market for decades, is suddenly going up. Purchasers such as public programs, insurers, employers, and union trusts, will have better ability to bargain with the drug companies, use the information provided to push back against justifications that don’t make sense, and have the 60-day advance notice to negotiate bigger rebates before having to change formularies or otherwise use their purchasing power. Policymakers, purchasers, and researchers will have a new central source of information to identify trends and issues in prescription drug prices to serve as a guide for future reform efforts. Also signed today was AB 265 (Wood), which prohibits prescription drug manufacturers from offering discounts for name-brand drugs, if a less-expensive equivalent brand is available, preventing the use of higher priced drugs when unnecessary. Both bills were part of a package of legislation supported by consumer groups on prescription drug prices. Three other bills related to prescription drug prices are pending for next year.